I’ve made these hotcakes a bunch of times since owning the book Bills Sydney Food where he shares this recipe for everyone to enjoy. 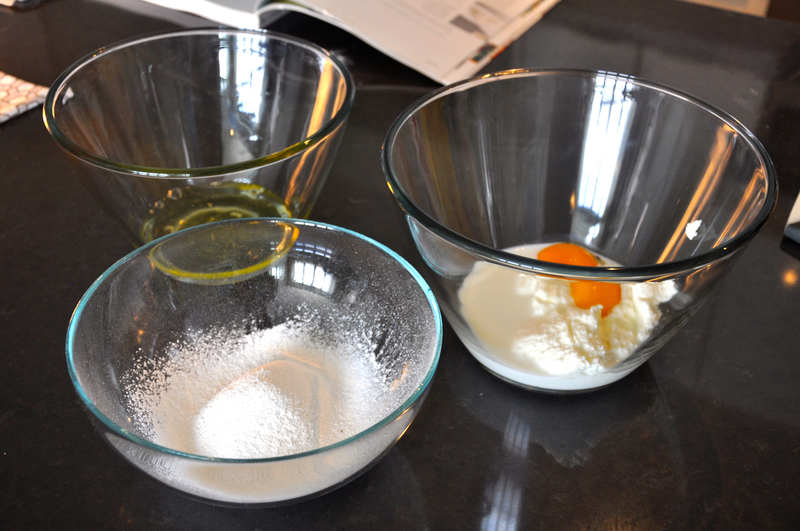 It’s an easy to follow recipe although there are a few steps involved in preparing the batter like folding egg whites. No matter how many times I make this dish I always forget about the whole folding in of egg whites step. I end up doing it of course but at the start I’m thinking “Gosh, I should make these more often. It’s easy really.” And then my heart sinks a little and I remember I have to whisk and whisk and whisk and fold and fold and fold. 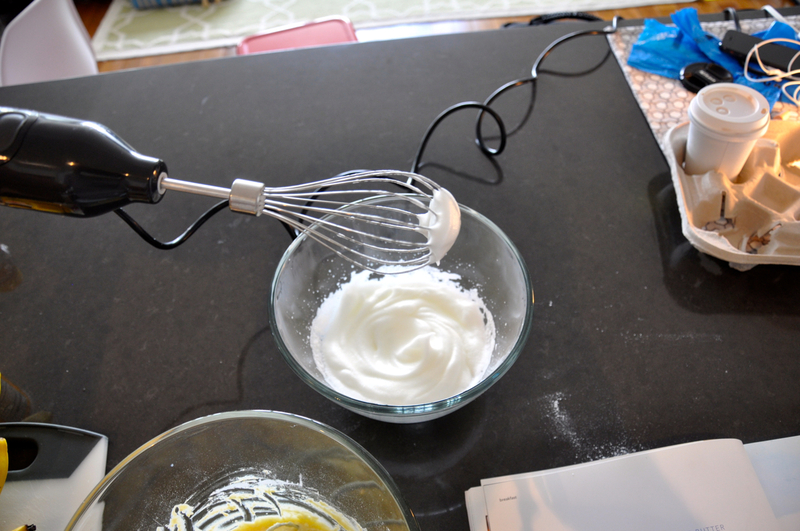 It’s not that much extra work but when all you want to do is eat and eat and eat, this whisking step just feels like a real pain. Oh and you’ll need to set aside some time to make that honeycomb butter. You have to serve the hotcakes with the honeycomb butter. Seriously, that butter really turns up the volume (I couldn’t resist). For anyone who is still reading and has had an aversion to the idea of ricotta in hotcakes let me assure you that there’s nothing cheesy or savory about this dish. 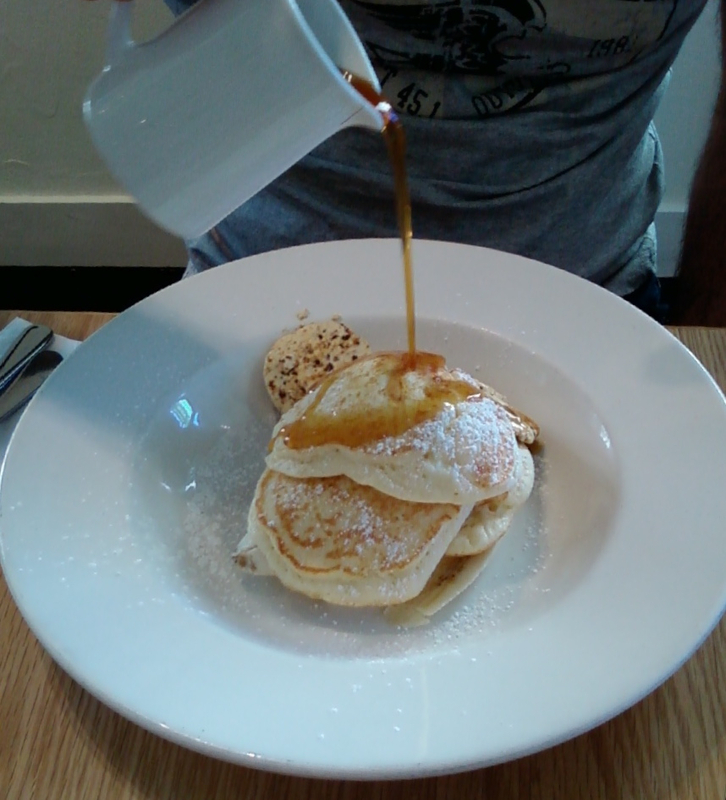 These hotcakes are more like very fluffy pancakes and with the honeycomb butter melting all over them and warm maple syrup drizzled on top (that’s how they serve it at the restaurant) you are in for a delicious breakfast. Ok, now it’s time for a small confession. You see that featured photo of the hotcakes and the one below? Ok, so I didn’t make those hotcakes. They are all hotcake food shots from some of my previous visits to Bills. 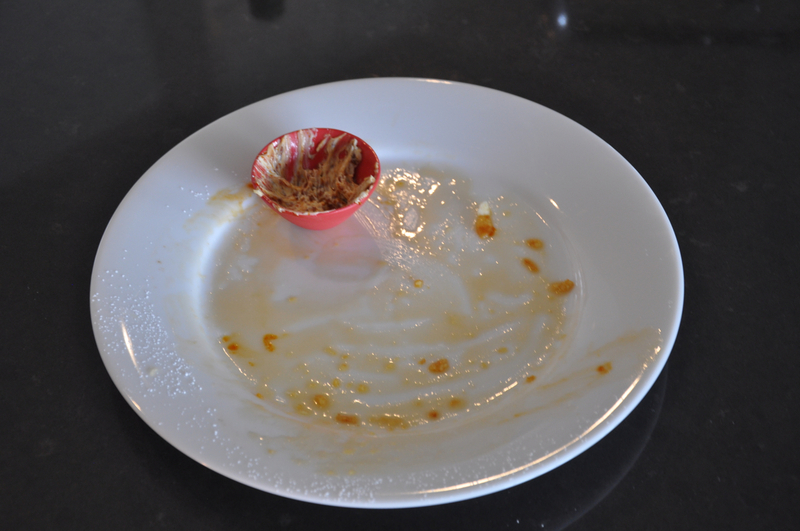 I wasn’t too happy with the quality of the finished product photo that I produced. Don’t worry, I’ll show you what mine look like but they’ll be buried deeper down in this blog post mkay? Ok. First things first. We need to make the honeycomb butter. 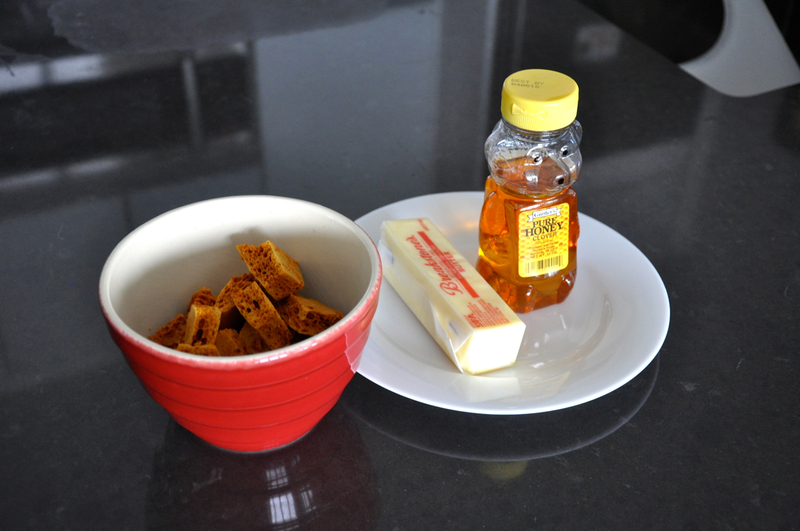 So start with your butter, honeycomb (here’s how to make your own honeycomb) and honey. Smash up your honeycomb (I covered mine in some baking paper to avoid too much mess) and combine the ingredients. Time for my Breville do-it-all mini mixer to take center stage again. Pour out to cling wrap and roll (actually this photo was after we went through a bit of it) put back in refrigerator to chill up. Store the rest in the freezer when you’re done. 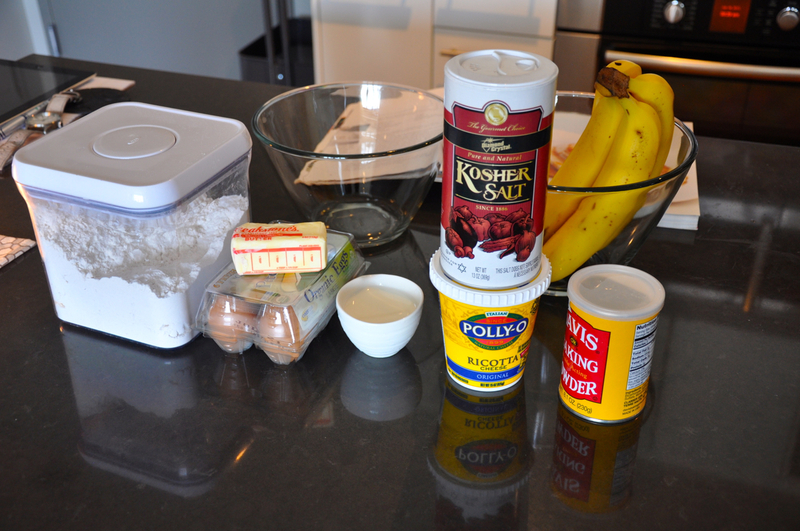 Now it’s time to make the hotcakes. Start with your ingredients. Separate your eggs. Combine yolks, milk and ricotta in one bowl. Sift your flour and salt in another bowl. 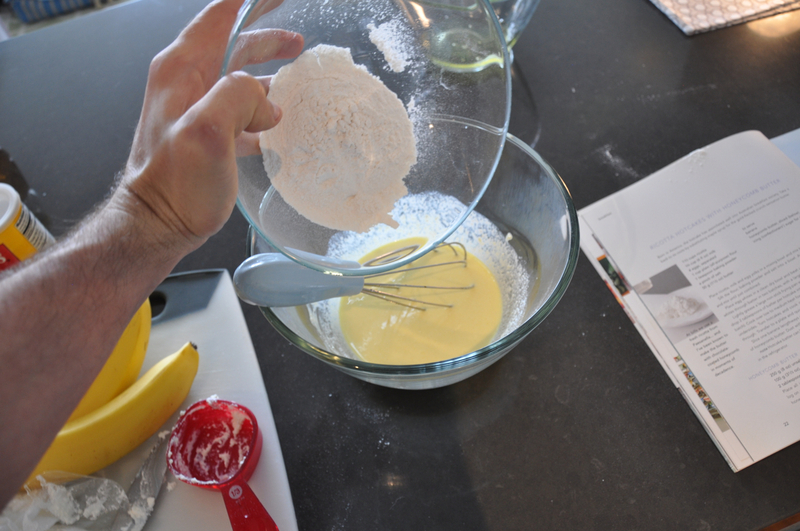 Add the flour to your ricotta mixture. 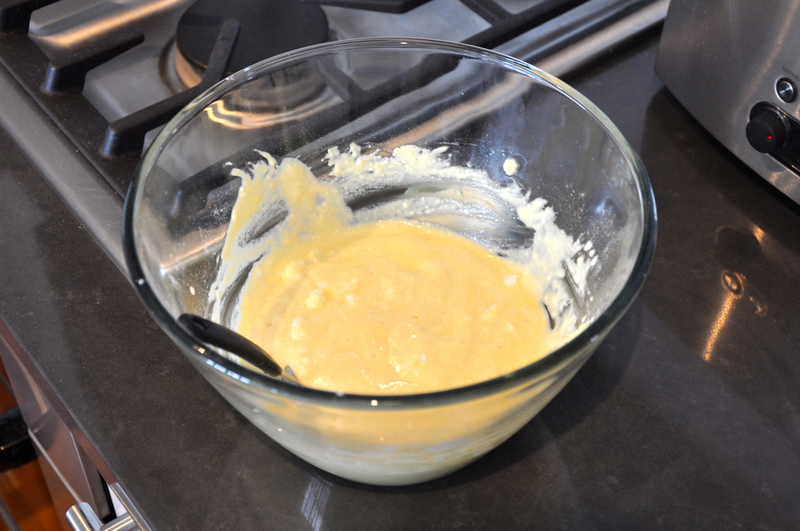 Whisk your egg whites (whisk attachment on the same Breville gadget from above) and fold into the hotcake batter. Heat your non stick frying pan with butter and spoon in your batter mixture being careful not to make more than 3 at a time. I use 3 heaping tablespoons as 2 tablespoons (as stated in the recipe) is not enough. When I have friends over for hotcakes I’ll have up to 2 additional pans on the burners at the same time. Basically as many pans as I have lying around that will do the job. That way no one is eating cold hotcakes. I suppose I could invest in a large griddle? Dust with confectioners sugar. 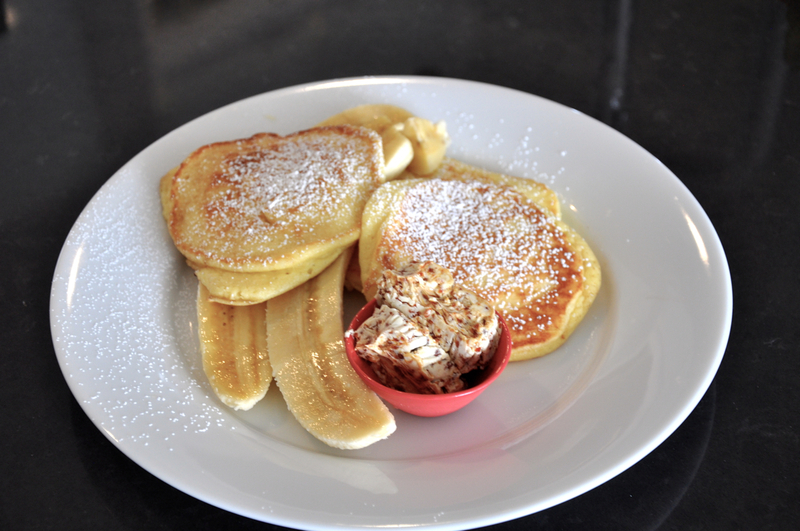 Serve with sliced bananas, honeycomb butter, warm maple syrup and devour. They were just awful as you can see. Breaking news for US peeps! Soon, you too will be able to get your fill of Bills when he opens his first US location. That’s if you happen to live in Hawaii, specifically Waikiki. Oh Bill, when are you coming to NYC? People would line up around the corner just for your breakfasts. The recipe below is the original recipe from the book. I actually halved this recipe as I was only trying to make it for two. I would recommend following the steps below exactly if you want to feed 3 or more people. Lightly grease a large non-stick frying pan with a small portion of butter and drop 3 tablespoons of batter per hotcake into the pan (don’t cook more than 3 per batch). 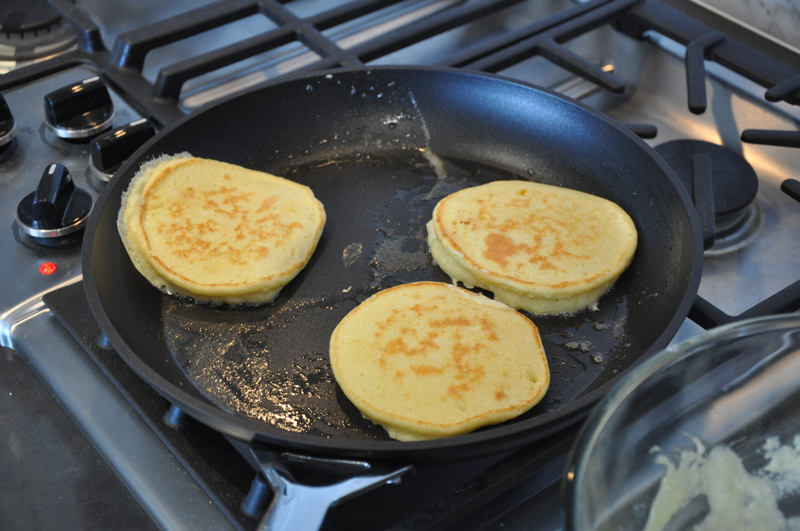 Cook over a low to medium heat for 2 minutes, or until hotcakes have golden undersides. Turn hotcakes and cook on the other side until golden and cooked through. Transfer to a plate and quickly assemble the other ingredients. 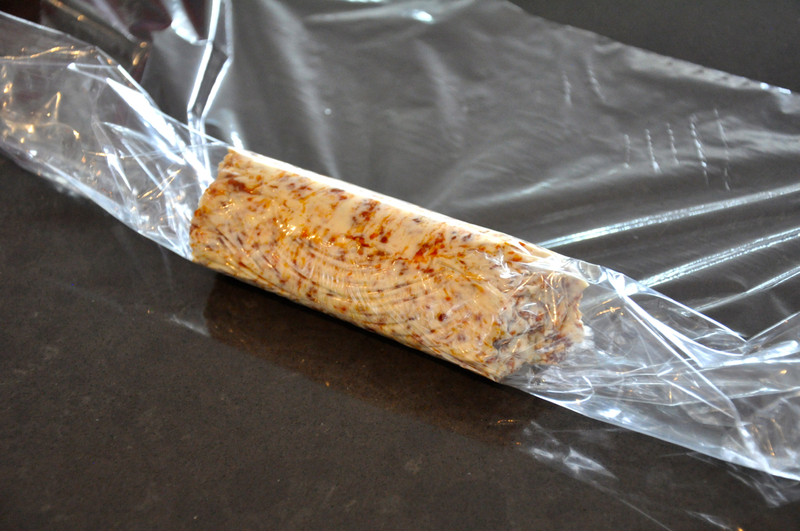 Shape into a log on plastic wrap, roll, seal and chill in a refrigerator for 2 hours. Store remainder in freezer for future use.